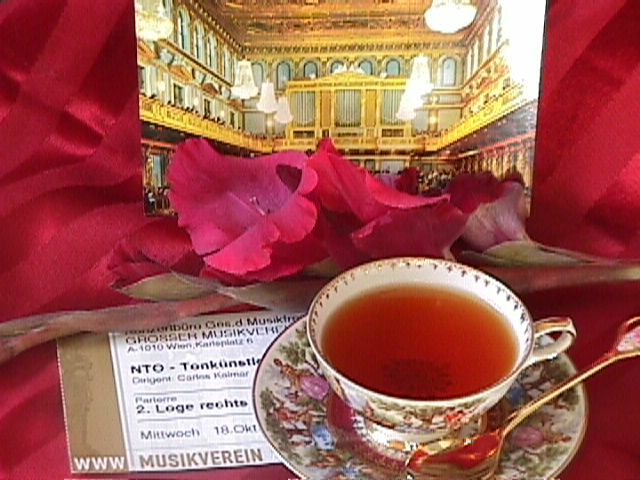 11 years ago today I was sitting in the Golden Hall in Vienna listening to a concert and grinning ear to ear. It was a dream come true moment for me. Every year since then, I revisit that golden moment with my scrapbook and a pot of tea. When I was still in the tea business, I created a special Ceylon blend called Golden Hall. Nowadays, I toast Vienna with someone else’s loose leaf creation. I still have the tin I brought home from the fabulous Julius Meinl store on Graben. The tea is long since gone … but it holds my memories. So here’s a sip to Vienna and returning again someday!